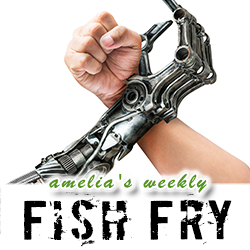 This week’s Fish Fry is dedicated to one of our favorite topics: robotics. Fish Fry field reporter Larra Morris takes us on a special guided tour through all of the rabid robotic rambunctiousness of this year’s RoboUniverse. Larra investigates the what, where, and how of “cobots” with Scott Mabie of Universal Robots. Then Larra chats with Jeff Burnstein (President – Association for Advancing Automation) about trends in automation, where you can get help with your next automation project, and the role of robotics in the global economy. Lastly, Larra checks out the Model A – a brand new personal autonomous device with a little help from Phil Mann from 5D Robotics.